This is despite the announcement by the Oceania Football Confederation (OFC) that the Pacific Games will no longer be used as the preliminary qualifying rounds for the Oceania 2014 FIFA World Cup BrazilTM and the Women’s Olympic Football Tournament London 2012. A statement released by OFC through www.oceaniafootball.com on June 26 explained that the action is due to uncertainty about the inclusion of Guam in the football competitions at the Pacific Games. Guam is a member of the Asian Football Confederation (AFC) and, thus, is not qualified to take part in any qualifying competition for any FIFA championship. The statement quoted OFC general secretary, Tai Nicholas, as saying that OFC had no other choice and is disappointed about the situation. “FIFA have been very clear that they cannot approve a FIFA qualifying event where non-OFC members are participating,” Nicholas says. SIFF general secretary, Eddie Ngava, said in a statement last week that the ruling is well received and the national federation wants to make use of the opportunity that the situation has presented. Ngava went on to say that the major issue will be finance for the 2 teams to attend the games and SIFF is working overtime to come up with the funds to ensure that Solomon Islands is represented. 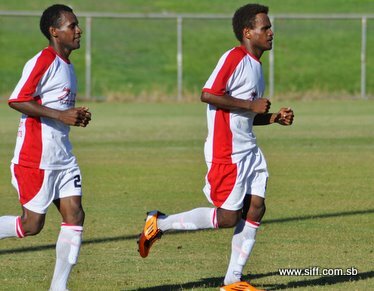 Two (2) international friendly matches with Vanuatu are to take place this week and SIFF is hoping that the public turnout will generate the bulk of the money required. The first match will take place on Thursday and the second one on Saturday. For OFC the decision to remove the qualification status from the Pacific Games has culminated in the proposal of an alternative qualifying competition for the 2014 FIFA World Cup BrazilTM. The OFC website reports that a four-stage qualification process has been come up with and FIFA has already applied its stamp of approval. The first stage will see the four lowest-ranked OFC member associations (based on the FIFA/Coca-Cola ranking and other sporting reasons) take part in a tournament based on a league system from 21-26 November 2011. The countries involved will be American Samoa, Cook Islands, Samoa and Tonga, and the top finisher will advance to the second stage, joining the remaining seven OFC teams that received a bye in the first stage. Stage two will see the revival of the OFC Nations Cup where eight countries – namely Fiji, New Caledonia, New Zealand, Papua New Guinea, Solomon Islands, Tahiti, Vanuatu and the winner of stage one – will take part in a tournament based on a league system with semi-finals and a final. The tournament is scheduled for 1-12 June 2012 and the winner of the final will go on to represent OFC in the 2013 FIFA Confederations Cup. The winner of the third stage will advance to the inter-continental play-off for a place at the 2014 FIFA World Cup Brazil™. Whether the OFC representative will face an Asian, Central American or South American opponent will become known after the 2014 FIFA World Cup Brazil™ Preliminary Draw on 30 July. An alternative option for women’s Olympic qualifying has also been found. New Zealand will be seeded to the second stage while the eight other OFC member associations who are International Olympic Committee (IOC) members – American Samoa, Cook Islands, Fiji, Papua New Guinea, Samoa, Solomon Islands, Tonga and Vanuatu – will play a tournament based on a league system with semi-finals and a final. The winner of the preliminary stage final will then play New Zealand in a one-off match hosted by the preliminary winner. As was the case for the 2008 Olympics, the winner of this match will qualify for the Women’s Olympic Football Tournament London 2012.